The Red Flag Campaign is a community-level strategy, designed to build bystander intervention skills and change social norms on campus. To implement the campaign, a campus purchases a campaign package. POSTERS: The "face" of the campaign. 20 copies each of eight double-sided POSTERS (choose between SERIES A or SERIES B) that illustrate elements of dating violence and how friends can intervene. The back of each poster explains in greater depth the hallmarks of healthy relationships. CAMPUS PLANNING GUIDE: The "heart" of the campaign. A comprehensive ORGANIZING GUIDE with step-by-step directions to launch the campaign, including how to use the campaign to enhance current campus programming, how to build new campus events around it, and how to sustain community-level change. RED FLAGS: 200 RED FLAGS (4" x 5") to be posted publicly 1 week before posters and other programming launch to create buzz on campus. Choose between SERIES A or SERIES B posters. Each series illustrates the following red flags: sexual coercion, victim blaming, emotional abuse, sexual assault, stalking, isolation, and jealousy. 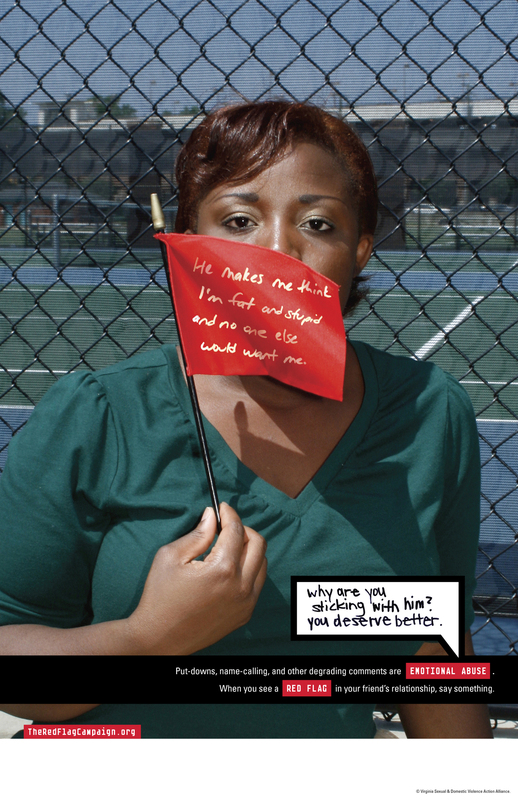 The Campus Planning Guide offers step-by-step directions for launching The Red Flag Campaign on your campus. Delivered electronically, the Campus Planning Guide includes concrete suggestions for maximizing the impact of The Red Flag Campaign, how to use it to enhance current campus programming, and how to build new campus events to sustain change. Specific attention is given to spreading the word by involving groups, such as resident advisors, faculty and staff, athletes, fraternities and sororities, LGBTQ groups, and other campus service organizations. Graphics files for creating ads or flyers tailored to your campus’ campaign. The Red Flag Campaign Package includes 200 (4" x 5") waterproof red flags featuring The Red Flag Campaign website address. Installing these flags one week prior to posters will create a buzz on campus before your official campaign launch.